Instagram is promoting cosmetic surgery to children as young as 13. The Times created an account on the social networking service, which is owned by Facebook, purporting to belong to a 13-year-old girl. Posts appeared in the “Explore” feed only minutes after influencers and reality television stars were followed. One post included before-and-after pictures of a young woman who had rhinoplasty, with the caption: “The difference a nose job can make”. Other pictures showed a young woman having fillers placed in her jawline. 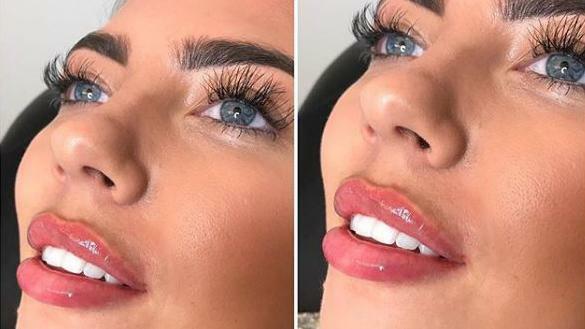 Another picture, which had more than 1,000 likes, promoted “trial” lip filler for £30. Those who book a lip filler appointment after this treatment are promised a discount. Packages of cosmetic treatments combined for a set price also appeared on the 13-year-old’s profile. A British business selling a “Kim Kardashian package” of jawline, cheeks and chin sculpting for £500 had nearly 100,000 followers, with most of the comments on its posts from young women. Experts said that posts promoting surgical and non-surgical treatments on children’s accounts were worrying and irresponsible. “[These posts] are normalising treatments that should be medical. It’s not a routine beauty treatment; these are serious medical treatments.” Badly placed lip fillers can lead to permanent scarring, while facial fillers can cause blindness if placed incorrectly. “It’s hooking teenagers. The hook is not just introducing them to treatments, it also works because it’s undermining their self-esteem at the same time,” Dr Grover added. Instagram uses an algorithm to serve up more of what it believes a user might like based on who they follow and which posts they interact with. The Explore section on the app is where users are shown pictures that have been liked by people whose photos and videos the user has liked or those that get a high number of likes or views. Cosmetic surgery practitioners said they were seeing a growing number of inquiries from under-18s, with social media playing a large role in driving interest. Save Face, a government-approved register of accredited practitioners providing non-surgical treatments, received 934 patient complaints last year regarding unregistered practitioners. About 62 per cent of the complainants found the practitioners through social media, it said. Of those, more than a quarter chose their practitioner based on the number of followers and before-and-after images, Save Face found. Almost half of complainants were aged between 18 and 25. There is no legal minimum age governing when people can undergo procedures but many practitioners refuse to treat those under 18. Others will inject dermal fillers as long as the individual is 16 and has parental consent. Instagram is already facing criticism for showing posts glorifying depression and suicide, as well as hosting images promoting eating disorders. Last week, 16 social media stars including the singer Rita Ora promised to clearly state if they had been paid for products they endorsed. Instagram declined to respond to specific questions but said it took the wellbeing of its community seriously.